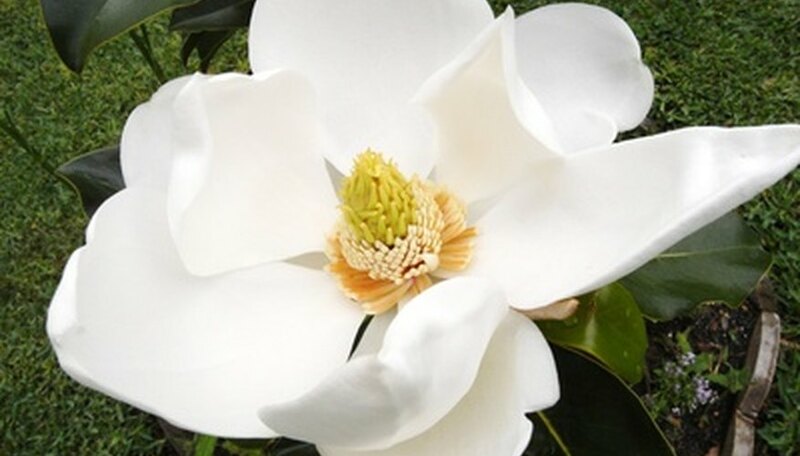 Magnolia (Magnolia grandiflora) is native to the southeastern regions of the United States and Asia. Their primary United States location is along the Coastal Plains stretching south from North Carolina through the lower southern states to southeast Texas. Trees are large, growing anywhere from 60 to 80 feet in height and gardeners adding them to their landscapes will have a hardy and relatively pest-free addition. Blooms produced in summer are up to six inches in diameter, creamy white with a delightful fragrance. This stately tree of the south will add southern charm to any landscape. Select a healthy looking magnolia tree that has not outgrown its container. Gardeners will find containerized trees in a vast array of sizes from two to three feet tall to ten feet tall. If the tree is too large for the container, the roots are possibly root bound and the tree may not grow properly. Consider the mature size of the magnolia tree when selecting a site in your landscape. Trees grow quite large and require adequate space for proper growth, so consider any structures or power lines that the tree can interfere with when selecting a site. Select a site to grow your magnolia grandiflora that receives full to partial sun throughout the day. Trees will perform best and produce the most blooms when receiving some amount of sunlight during the day. Grow the magnolia tree in a rich soil medium that drains well for best results. Magnolias will tolerate some periods of wetness, but will do best in a soil that drains. Amend the planting site with peat moss to add acid to the planting site as well as compost or manure. Plant magnolia grandiflora trees in spring to give the trees time to establish themselves into the planting site before winter. Dig a hole two to three times wider than the magnolia's root ball. Remove the magnolia from its container and inspect the roots. If they are wrapping around in a circle, make two to three vertical slashes through the root ball. Place the magnolia into the hole and cover with soil, being sure to plant no deeper than the tree was growing in the container. Water the magnolia tree regularly to keep the planting site moist, especially during periods of hot, dry weather. Magnolia trees prefer receiving regular watering for best growth and bloom production. Apply a layer of mulch around the base of the tree to help the soil retain its moisture and cut down on the unwanted growth of weeds or grasses. Apply approximately three inches of mulch keeping it three to four inches from the tree’s trunk. Fertilize the magnolia tree in early spring with an acid-based, slow-release fertilizer spread per the package instructions under the tree’s canopy. Using a fertilizer appropriate for azaleas, gardenias or rhododendrons is sufficient. Prune the magnolia grandiflora after flowering to remove any dead wood or weak branches. Magnolia trees do not require extensive amounts of pruning. The magnolia seeds are a source of food for birds and wildlife. Pests are generally not a problem. Magnolia grandiflora has a high wind and salt tolerance making it a good species for coastal plantings. Magnolia grandiflora trees have large, rope-like roots making them a difficult transplant prospect, especially if the trunk is larger than four inches in diameter. Gardeners will have better success transplanting magnolia trees with trunks smaller than four inches in diameter.